SPRINGFIELD – Voters in the western suburbs would have local control over the makeup of the Fox Metropolitan Water Reclamation District board under legislation advanced today by State Senator Linda Holmes (D-Aurora). Holmes’s proposal, Senate Bill 2830, would allow voters in the areas served by the Fox Metro Water Reclamation Districts to elect their own trustees. These areas include Aurora, North Aurora, Boulder Hill, Montgomery, Oswego, Sugar Grove and portions of Yorkville and Batavia. Under current state law, Fox Metro Water Reclamation District trustees are appointed by members of the General Assembly, instead of being selected by voters in their area. “Water Reclamation Boards make decisions that affect people’s lives every day. Voters, not politicians, should be allowed to choose who makes these decisions,” Holmes said. Under Holmes’s proposal, members of the board will be elected beginning in the 2019 consolidated election. The board would continue to have five total members. Current members would continue to serve until their terms expire. Holmes’s proposal passed the Senate with a vote of 54-01. It will now head to the Illinois House of Representatives. AURORA – Aurora schools will receive over $20 million in new funding thanks to the school funding formula overhaul supported by State Senator Linda Holmes (D-Aurora). Last week, the Illinois State Board of Education issued funds under the new formula to school districts around the state. The distribution is based on detailed enrollment figures, district-specific student learning needs, the availability of local resources and other data. Intended as a first step toward fairer state support for every school district, the formula ensures no schools will ever receive less state funding than they do today under the new plan. Under the new formula, over $20 million in new, additional funding from the state will be sent to school districts serving Aurora. Aurora East Unit School District 131 will receive over $12.6 million, one of the largest funding increases in the state. Aurora West Unit School District 129 will receive $6.4 million and Indian Prairie School District 204 will receive over $700,000. 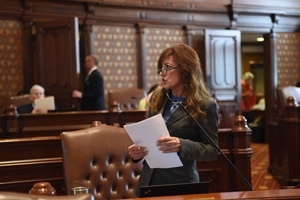 SPRINGFIELD – To improve access to information about human papillomavirus (HPV) for young people in Illinois, state Sen. Linda Holmes (D-Aurora) introduced legislation in a Senate committee meeting. Holmes’ legislation requires students entering sixth grade to be given information about the HPV vaccine from a doctor. Starting in 2007, state law began requiring only female students to receive this information. The Centers for Disease Control has recommended and approved the vaccination for males since 2011. The legislation, Senate Bill 2866, was approved by the Senate Public Health Committee. It awaits consideration by the full Senate. “The governor’s latest budget proposal is full of accounting tricks and irresponsible cuts that will create burdens for taxpayers in the future. By shifting a large portion of pension costs to local school districts, Rauner’s latest budget could lead to higher property taxes and greater educational inequality. “The proposal also does little to address the state’s backlog of bills, which was most recently reported at nearly $9 billion with more than $900 million in late fees.